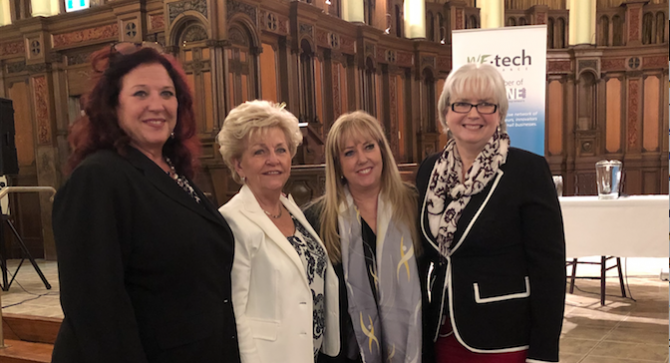 On Thursday, March 8th, the University of Windsor EPICentre kicked off the Windsor-Essex International Women’s Day events with a panel discussion featuring three powerful, female leaders in the community. Janice Kaffer, CEO of Hôtel-Dieu Grace Healthcare, Pat Soulliere President & CEO of Soulliere Financial and Sherrilynn Colley-Vegh, Director of Leadership and Training at Leadership Windsor-Essex United Way joined us for a panel discussion lead by AM800’s Patty Handysides at Water’s Edge Event Centre. The historic venue held 130 community members who enjoyed a fully catered meal by Koolini Italian Eatery and not only had the opportunity to listen to this insightful discussion but were able to participate in a Q&A session, asking the panellists questions ranging from workplace issues to personal insecurities. The goal of the event was to bring community members together to discuss important issues not only pertaining to women but any leader (or future leader) in the workplace. The EPICentre is happy to announce that we will be hosting another panel discussion this Fall, stay tuned for more details.